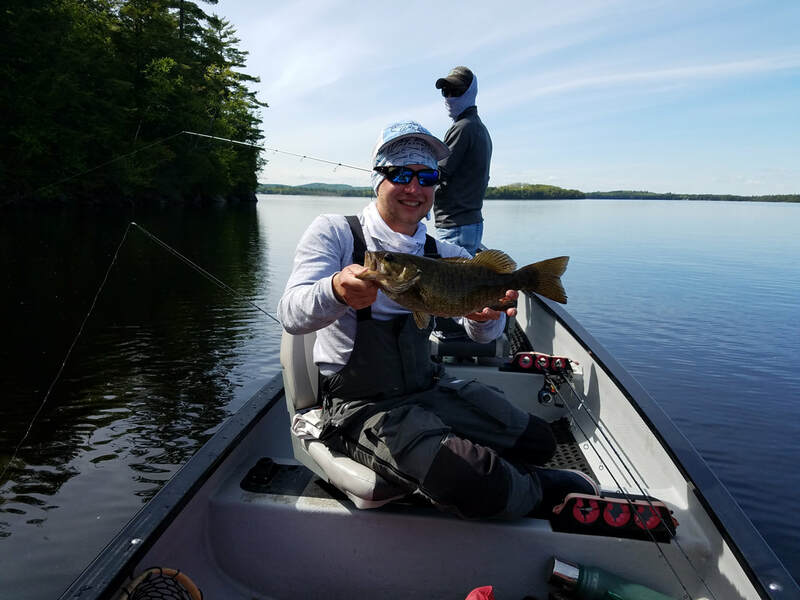 Smallmouth Bass - as the water warms in May, we fly fish or spin cast for smallmouth bass in the Penobscot river and St. Croix rivers, as well as lakes near Grand Lake Stream and Acadia National Park. This includes West Grand Lake, Big Lake, Baskahegan, and others. Maine is full of feisty, hard fighting bronzebacks. 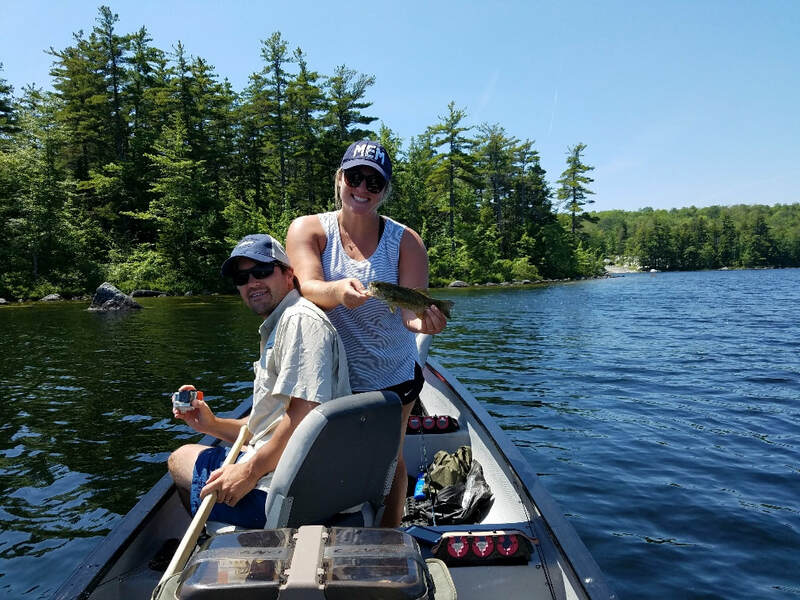 We fish out of a 21 ft Maine Freighter canoe with a 9.9 hp outboard, a very stable boat where you can stand-up and cast with ease.​​ We also fish out of a traditional Grand Laker. 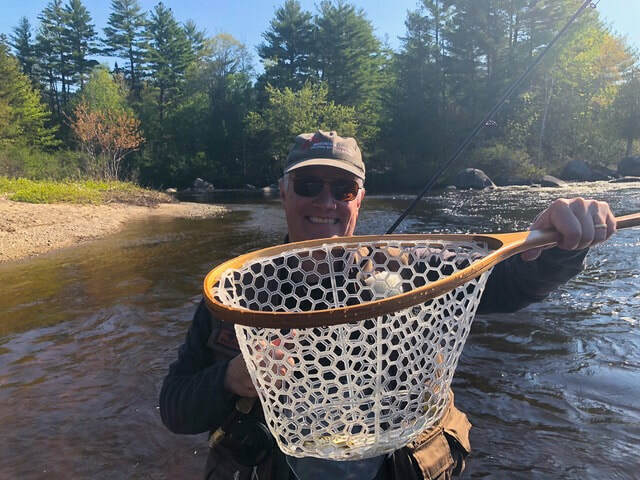 Fly Fishing - we fly fish for brook trout and landlocked salmon in Grand Lake Stream and the West Branch of the Penobscot. Three mile long, beautiful Grand Lake Stream with it's gin clear waters is noted for it's fine landlocked salmon fishery and surrounding beauty. The West Branch of the Penobscot is another Maine gem, with stunning views of Mount Katahdin, and noted for it's landlocked salmon and brook trout. Being a tail-water of Ripogenus Dam, it stays cold throughout the hot summer months which means a longer fishing season. 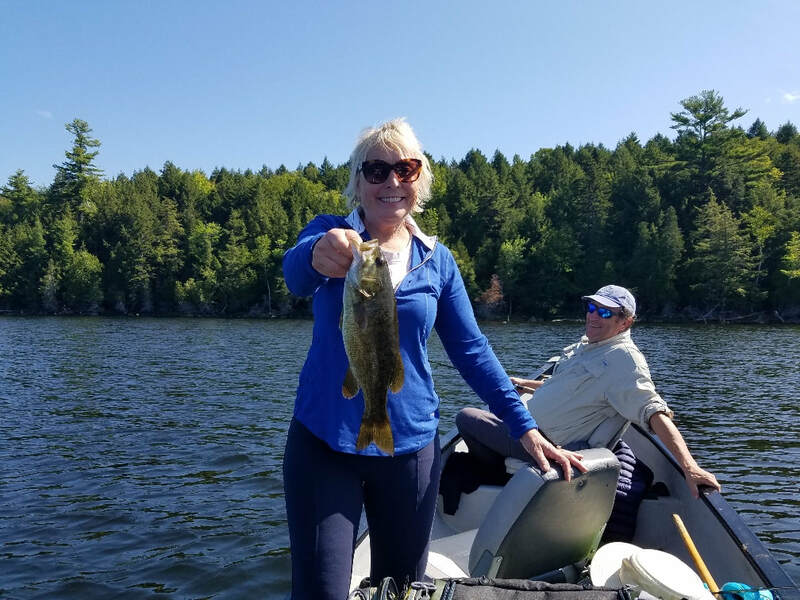 In other waters the fishing slows down with the heat of summer until September brings cooler nights and the fly fishing picks up again until the season ends the last day of the month. We do some overnight camping for multiple day trips. Remote Ponds - We fish remote ponds for wild brook trout out of a canoe in the Moosehead Lake and Deboullie regions. This is best done late spring into early summer, culminating with the Hex hatch. Fishing the hatch of these huge insects as the sun is setting on a remote Maine pond is something every fishermen should experience at least once in his or her lifetime. 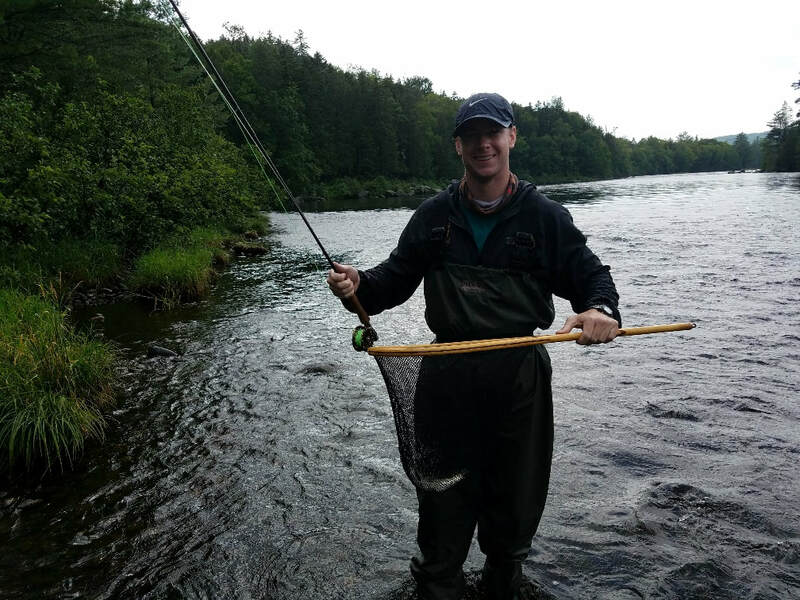 Stillwater fishing in Maine for wild brookies using dry flies is one of the most exciting ways to fish. Remote fishing requires either overnight camping or staying at a Maine Sporting camp. Call early so we can make the necessary arrangements. Basic Instruction - we offer basic fly fishing instruction. Patient, methodical, one-on-one, personalized teaching. 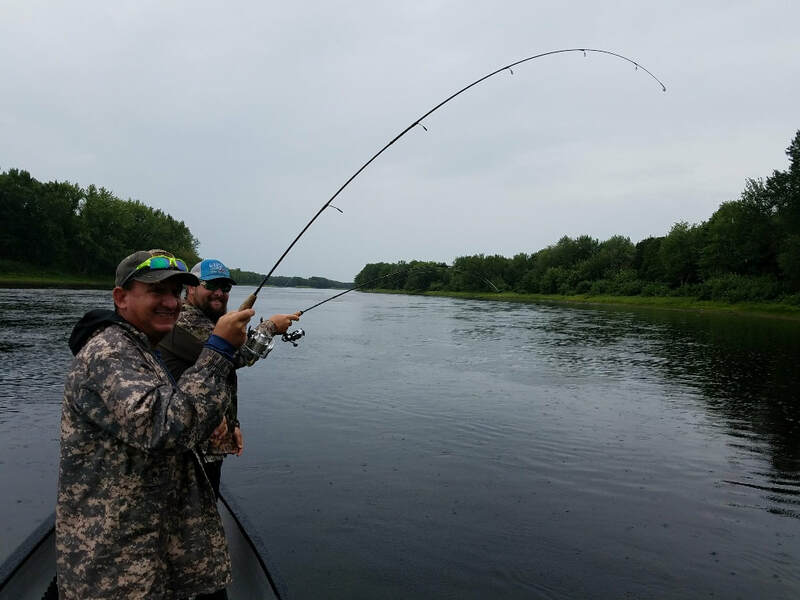 Learn the basics of rods, reels, lines, bugs and flies, knots, casting, how to read water, presentation, catching and releasing fish. A half day of instruction followed by a half day on the water. Lunch included. See our "Basic FF class" page. Shore Lunch - lunch included for all full day outings. If fishing the Grand Lake Stream area, a traditional hot shore lunch is available. Your choice of steaks, chicken or pork chops, with standard items such as fried potatoes and onions, cheese and pickles, guide coffee and homemade baked goods are all cooked over an open fire. All gear (fly rods, spinning rods, lures, flies, waders) included. We can take up to two people at a time. All you need to bring is rain gear, hat, bug spray, sunscreen and polarized sunglasses. First time fly fishing? No problem. We specialize in beginners. Our job is ensuring you have an enjoyable day on the water creating great memories, and of course, yelling FISH ON!